One of our Pre-K teachers was kind enough to remind me that March is really going to be here next week. She is getting ready to decorate so she wanted to make a St. Patrick's Day decoration for the room. They really add a "sparkle." 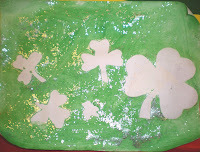 The first step to this project is to let the children attach as many or as few shamrock shapes to their construction paper. We had some nasty glue sticks that don't work so well, so the teacher let the children pick their shapes and glue them to their paper. The shapes actually need to be peeled off at a later time, so you can try taping them down to. 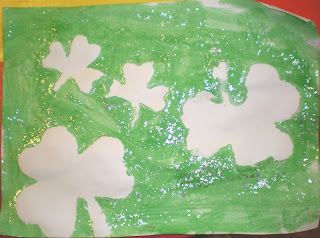 The next step is to paint the whole paper with the "lucky shamrock paint." Pour green paint, some glue, and some silver glitter in a container and mix together. The children will paint over the shamrocks with this paint. After the paint has dried a bit, you take off the shamrock shapes and you have a wonderful, unique piece of art. Can't wait to do this with the girls! Thanks for posting! They have a bit of Irish in them. Their Pa Pa is full Irish on my husband's side, so we like to celebrate. Have a wonderful Wednesday. We're off to the Science Center today for some Chemistry fun! I have done this before!! I love it! Something else that I have done, is use blue masking tape make your shape on the paper (water color paper is awesome with this tape) have the children paint then reveal the shape after. This is a great idea to reinforce eye hand coordination skills.